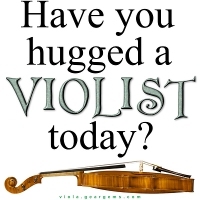 “Have you hugged a violist today?” If you play the viola and you’re wanting to be hugged, wearing one of these items or leaving another on your desk, car or in the music studio might just be the very hint that does the trick! This cute design would also make the perfect gift for the viola player in your life! Get it now on a t-shirt, hoodie, mug, tote bag or other quality apparel or giftware item, exclusively from Bratsche’s Viola Bazaar!